CW Orders Arrowverse Pilot Of New Batwoman DC TV Series Starring Ruby Rose As Kate Kane. David Nutter, who helmed ‘Game of Thrones, ‘Arrow’ and ‘The Flash,’ is on board to direct. It’s official: The CW is moving forward with a Batwoman stand-alone series. The network on Thursday handed out a pilot order for the Ruby Rose-led drama from showrunner and writer Caroline Dries (The Vampire Diaries) and exec producer Greg Berlanti. 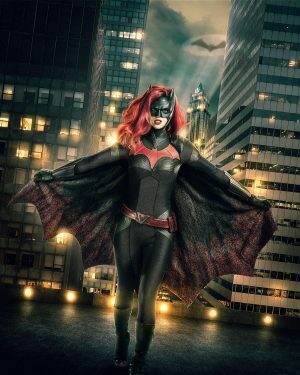 …The potential series breaks yet another barrier for Berlanti as Batwoman becomes the first-ever superhero series to be led by a lesbian character — and played by an openly gay actress in Rose.